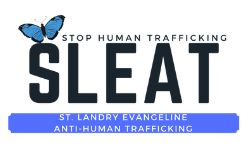 OPELOUSAS, LA–During National Human Trafficking Prevention Month, The St. Landry –Evangeline Anti-human Trafficking (SLEAT)Task Force will host an event to raise awareness and educate the community on eradicating human trafficking. The event will be held Monday, January 28, 2019 at the Delta Grand Theater at 6pm. Admission is free. Laura Balthazar, Director of the St. Landry-Evangeline Sexual Assault Center says the organization plans address human trafficking within St. Landry and Evangeline Parish. On Wednesday, January 9, 2019, Gov. John Bel Edwards announced a multi-year $1.2million funding stream from the US Department of Justice to the state of Louisiana to implement “The Louisiana Child Trafficking Collaborative” and fight against the nations’ fastest growing criminal industry: human trafficking. This event is free and open to the public for more information, email Ms. Balthazar at slesac@yahoo.com or call 337-585-4673.